Music Director Ludovic Morlot and the Seattle Symphony announce Noah Geller as the David & Amy Fulton Concertmaster. 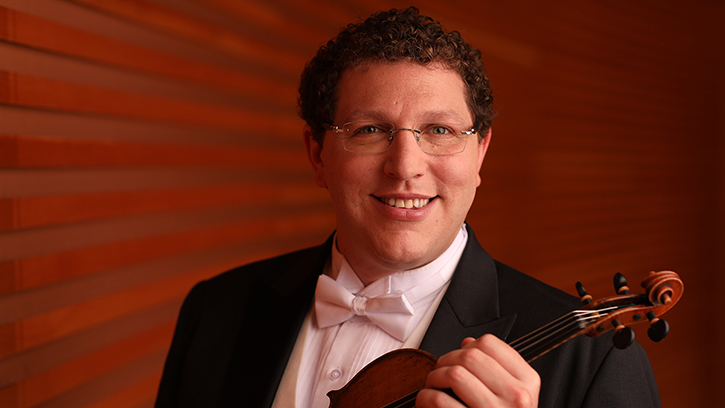 We are delighted to introduce the Seattle Symphony’s new Concertmaster, Noah Geller! Noah will join Music Director Ludovic Morlot and the orchestra as the David & Amy Fulton Concertmaster beginning at the start of the 2018–2019 season. Noah comes to the Seattle Symphony from the Kansas City Symphony where he is currently Concertmaster. He previously held posts in The Philadelphia Orchestra as a first violin section member and later as Acting Assistant Concertmaster. Noah attended The Juilliard School for both his Bachelor and Master of Music degrees and has also performed with many chamber and festival organizations around the country, including the Marlboro Music Festival, Orpheus Chamber Orchestra, Tanglewood Music Center, and here in Washington at the Olympic Music Festival in Port Townsend. “One of the great things about being a performer is the ability to communicate widely without using words, and it will bring me great joy to experience this kind of unique communication with each person in the audience every time we play,” he shared. “I am eager to begin this next chapter of my life and look forward to welcoming everyone in Seattle to our concerts!" Noah’s first concerts with the orchestra will be in September 2018. Please help us welcome him to the Seattle Symphony family! Through the caring support of our donor family, the Seattle Symphony is able to attract and retain world-class musicians like Noah. Join the community of supporters who make our music possible with your donation today!